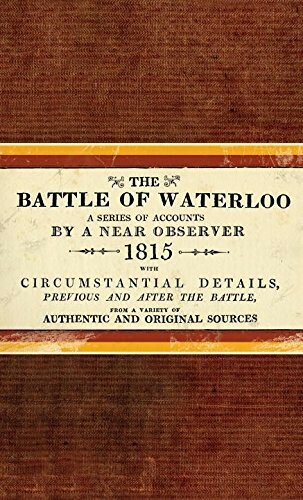 This book a facsimile reproduction of a contemporary account of the battle of Waterloo, packed with first-hand accounts and official reports. The first section is a narrative description of the campaign followed by various personal interpretations of the battle, including letters from such notables as the Duke of Wellington. This is followed by the official reports of the battle from all sides, including the various orders of the day issued to the different armies, the official gazette sent by Wellington and the first-hand accounts of French marshals such as Ney and Grouchy. The book concludes with sobering lists of the killed and wounded, those honoured after the battle and obituaries of the more prominent figures. The book features two beautifully detailed concertina-fold maps, one giving an overview of the campaign as a whole and the other detailing the positions on the battlefield itself. In addition to this there is a detailed panorama of the battlefield, done in pen and ink that is arranged in two six-part folded sections in the middle of the book.